Courtesy Building Services, Inc. offers an extensive array of janitorial services for offices and businesses in Dallas, Texas. Courtesy Building Services, Inc. is proud to render customized janitorial and maintenance services which have been tailored to suit the specific needs of our dear clients. Even though our operation is sufficiently designed to conduct major projects, exterior and interior alike, our services are also flexible enough to work with the current maintenance program of our clients. Our list of clients includes both commercial and government sites. Allow our expert consultants help you solve your most challenging environmental and cleaning concerns. A sanitary and clean workplace is vital for two main reasons. First, this has an effect on people. Employee health, wellbeing, and morale are involved, with customers often judging a business based on the appearance of its premises and facility. Second, clean surfaces are also protected against degradation and premature wear and tear. This is a vital cost-savings to business and property owners. While many business managers and owners are aware of it, it is just understandable that their time is used up by the daily operations of their business that leaves just a limited time to manage the cleaning of their premises. In fact, even bigger businesses find it challenging to manage a custodial staff because it is not part of their core competency in the first place. However, it is our core competency. Courtesy Building Services, Inc. knows how to properly survey your facility, identify your daily, weekly, and monthly needs, assign the required personnel, use the right equipment, offer supervision and training, and handle other cleaning needs. The cleanliness of a business is often one of the most overlooked aspects of running a business. But, office cleaning must always be a priority. When a company doesn’t use office cleaning as a tool, the business’s reputation will suffer some serious damages. Our general office cleaning service will ensure that the moment a customer or client enters your business, they will have the best impression about it. Clean offices promote the hard work concept, a value that potential clients will see right away. A cleaner office will also promote productivity. When your office is clean, organization is going to be implemented to keep up with the tidy and neat state as a whole. Organization is a crucial component in ensuring that your office runs smoothly every day. Finally, general office cleaning ensures that your employees will have lesser absences because of sickness. Germs won’t be able to spread because every surface is kept clean at all times. All commercial properties require cleanliness and proper maintenance and this is where our day porter service comes in handy. Without proper repair and cleaning, your building will soon turn into a gathering place for grime, dirt, cobwebs, trash, peeling paint, filthy restrooms, and streaked windows. None of these sound good and appealing and you can count on us to get rid of these problems before they turn into complete nightmares. Lack of basic minor repairs and cleanliness will lead to much bigger issues that can reduce the overall value of the property. To make sure that your building is clean and maintained, choose our day porter service to avoid disappointments. Our day porters are used to working in high traffic and busy areas and are very much familiar with all forms of trash removal and cleaning as well as painting and minor repairs. In commercial buildings and large offices, it is normal for floors to see tons of use every single day. Whether your floors are hardwood, linoleum, vinyl, carpet or other types of finish, proper floor maintenance and care is vital to maximize the longevity of floors. At Courtesy Building Services Inc., we strive to help offices and commercial businesses with all their floor maintenance needs. We will take full responsibility of maintaining and caring for your floors so you can just focus your attention to your business. If you have been neglecting the maintenance and care of your office floors for quite some time, you can just trust us to handle things from here onwards so you never have to worry about your floors ever again. Your floors have an impact on your business so never take them for granted. If the regular cleaning of floors in your commercial or office space doesn’t seem effective at all, it is time to consider floor refinishing. Courtesy Building Services, Inc. offers refinishing for all floor types for businesses. Depending on the current state of your floors, there is a chance that they just need a good burnishing or buffing for them to regain the shine they lost. But, if the finish is already too worn or your floors were not kept up that well, it is time for floor stripping and waxing, resealing, and finally refinishing. Courtesy Building Services, Inc is your perfect choice to do all your commercial cleaning requirements in Dallas. We serve every kind of small businesses and big corporations like multi-location organizations. Our process will provide you the healthiest and deepest level of clean, which dries faster compared to other usual carpet cleaning methods. If you consider us to clean your carpets, you can be confident you’re helping to have a clean atmosphere for your employees, enabling them to be more productive and make your business grow. Our exceptional services help provide the healthiest possible space for guests, customers, and workers alike. From cleaning small businesses to big companies, we have manpower, experience, and equipment to get the cleaning work done. We always promise to complete our job in a timely manner without getting in the way of your business activities. If you are a business owner, you like to concentrate on your company’s needs. As an owner of a restaurant, the last thing you want to worry about is your building’s windows compared to how foods are doing and ensuring that your customers are satisfied. At Courtesy Building Services, Inc, we fully understand how busy you are. That is the reason why we offer window washing service that is suited for your property’s needs. You won’t only be able to focus on your job, but also you can be assured that your interior and exterior windows are clean. There aren’t any mineral stains. Moreover, if you decide to choose our window cleaning service, you can guarantee that your business will not just be appealing on the inside, but also on the outside. Courtesy Building Services, Inc also offer light fixture cleaning and re-lamping services. We have re- lamped, cleaned, and retrofitted lots of lighting fixtures in the past, making us one of the best in this type of service. Light fixtures like incandescent and fluorescent tend to accumulate soil and dust particles on a particular period of time, which can result to decreased efficiency of lumen. Our light fixture cleaning services include the outside and inside of the fixture and bulbs and lamps therein. In many cases, there’s no need for you to replace prismatic light lenses, let us do the cleaning, and enjoy more savings. Light cleaning can boost the illumination provided at user-level because of the removal of dirt and dust from the bulbs and lamps. In addition to that, the removal of grime and dirt from your fixtures inside would boost the fixture’s efficiency and reflectivity. One of the primary benefits of hiring Courtesy Building Services, Inc for your cleaning needs is that your building will look and smell great. We specialize in cleaning duties of any commercial buildings. We can clean any kind of item or room and will make sure that we will leave your building looking attractive and appealing. As reliable commercial cleaning service provider, we empty all trash receptacles in the building and would sanitize and clean all of your bathrooms. We can also dust your building’s furniture and vacuum every carpeted floor. Another primary activity that commercial cleaners would do is to clean every mirror and window throughout the property and it includes periodic cleanings of curtains and blinds. One of the biggest things they’ll complete is hard-surface floors. Most commercial buildings have tile floors. Our team is always ready to clean all kinds of floors and would wax them if necessary. We are also experts in cleaning ceilings for bakeries, restaurants, commercial buildings, and so much more. Our professional methods can make your ceilings look brighter no matter what type of ceiling you have. Our comprehensive cleaning process provides a cost-effective and convenient alternative to tile replacement or painting. 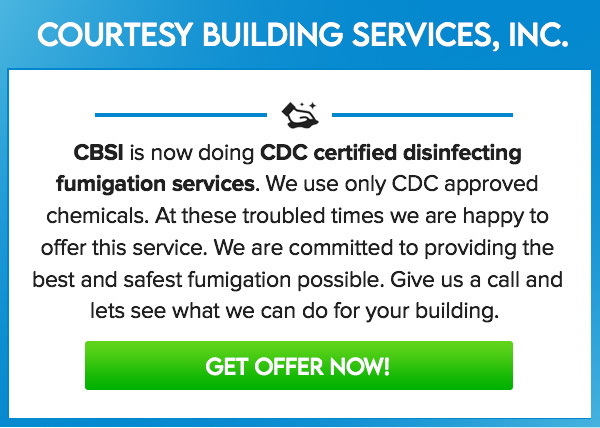 Just contact Courtesy Building Services, Inc. to arrange appointments. We will do all the work without distracting your business operations. The main element in successful performance of our cleaning services is the quality of people we hire to do the job for you. From bookkeeping and administration to marketing and sales to cleaning crews and operations managers, our team works hard to give you an outstanding service. Just give us a phone call at 800-479-3853 or 972-831-1444 (24/7) for a free demo of window washing, detailed cleaning, floor cleaning, and carpet cleaning.